This is one of the most versatile floor lamps available. It has a powerful LED light with two different adjustable parameters. First, you can adjust the brightness. There are five different levels of brightness, making the lamp adaptable to different settings. You can dim the brightness for a romantic dinner, or increase the brightness when reading or working on a puzzle. The second parameter that you can adjust is the color temperature. Like the brightness, there are five different levels of color temperature as well, ranging from 3000k to 6500k. The lower color temperatures offer warmer, softer lighting, and are more yellow in appearance. These warmer color temperatures are suitable for the evening hours when your tired eyes are getting ready to rest. The higher color temperatures offer cooler lighting that is more blue or white in appearance. These cooler color temperatures are suitable for the daytime when you need to be alert and when you need maximum visibility. The brightness and color temperature settings can be adjusted together, providing a total of 25 different light settings. With that much versatility, this lamp is suitable for any room in the house-the living room, the kitchen, the bedroom, etc. This tall standing lamp also has an adjustable gooseneck, allowing you to direct the angle of the light according to your needs. On the light pole, just below the adjustable gooseneck, is a control panel with a power button, a brightness button, and a color temperature button. However, there is also a remote control with these same buttons and more. In addition to the power, brightness, and color temperature controls, the remote also has two timer settings: 60 seconds and 10 minutes. When the timer is set, the light will automatically turn off after the set amount of time has past. With this timer, you can climb into bed with the light on and then let the lamp turn off automatically. All of these features make this a lamp like no other! BATTERIES NOT INCLUDED. FLOOR LAMP WITH ADJUSTABLE GOOSENECK - This standing lamp light features a flexible gooseneck that can be bent into whatever position you need. This makes the lamp suitable for any room. Bend the upper neck of the lamp to direct the light toward your reading chair or toward your dinner table. The gooseneck is easy to bend, but once bent it is strong enough to maintain its position. DIMMABLE LIGHT - This LED floor lamp can be dimmed to varying degrees of brightness. This allows you to set mood lighting for a romantic dinner or increase the brightness while reading or working on a puzzle. There are five levels of brightness that can be set either from the remote control or from the control panel built into the light pole. ADJUSTABLE COLOR TEMPERATURE - In addition to five different levels of brightness, this LED lamp also has five different color temperature settings. Choose a cooler color temperature (more white or blue in appearance) during the day when you need to be more alert. Choose a warmer color temperature (more yellow in appearance) in the evening as you are winding down. TWO TIMER SETTINGS - This floor lamp can be set to a 60 second timer or to a 10 minute timer. When using the timer, the lamp automatically turns off after the set amount of time has passed. If using the lamp in your bedroom, this timer can be used at bedtime so the light will turn off automatically after you have climbed into bed-no more tripping in the dark on your way to bed! REMOTE-CONTROLLED - With this remote-controlled LED lamp, you'll never need to leave the sofa to turn on the light. Leave the remote on the coffee table or your bedside table for easy access. 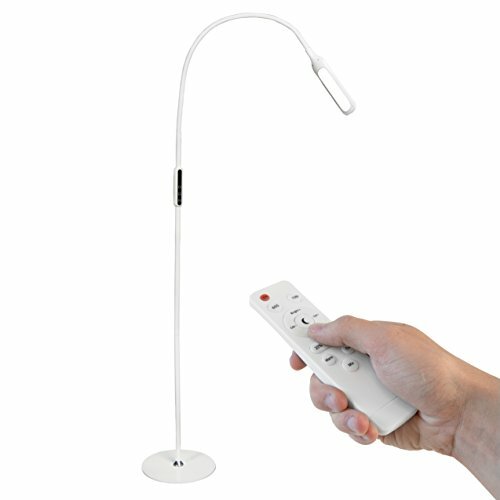 The remote control allows you to turn the lamp on and off, adjust the brightness and color temperature, and set a timer. There's also a night light button that puts the lamp in energy-saving mode. BATTERIES NOT INCLUDED.